Sol 2254-55, December 10, 2018, update by MSL scientist Mariah Baker: Today was one of those planning days when you realize the importance of being able to adapt quickly and think on your feet (i.e., wheels) when operating a rover on Mars. Our previous plan brought us to the Lothian E area, where we hoped to find an exposure of red Jura rock that was suitable for drilling. Unfortunately, the bedrock at this location appeared just as fractured as at the previous site, forcing the team to rethink the weekend plan. 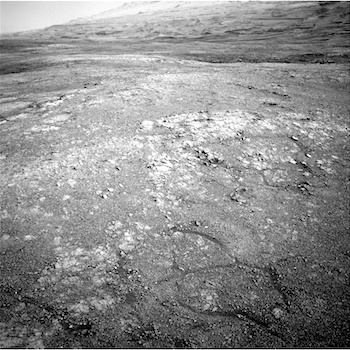 This entry was posted in Reports and tagged Aeolis Mons, Blackfort Hill, Curiosity, Dalziel, Gale Crater, Jura, Lothian, Mars Science Laboratory, Mount Sharp, MSL, Murray Formation, NASA, Newburgh, Springside, Vera Rubin Ridge, Woodhill. Bookmark the permalink.